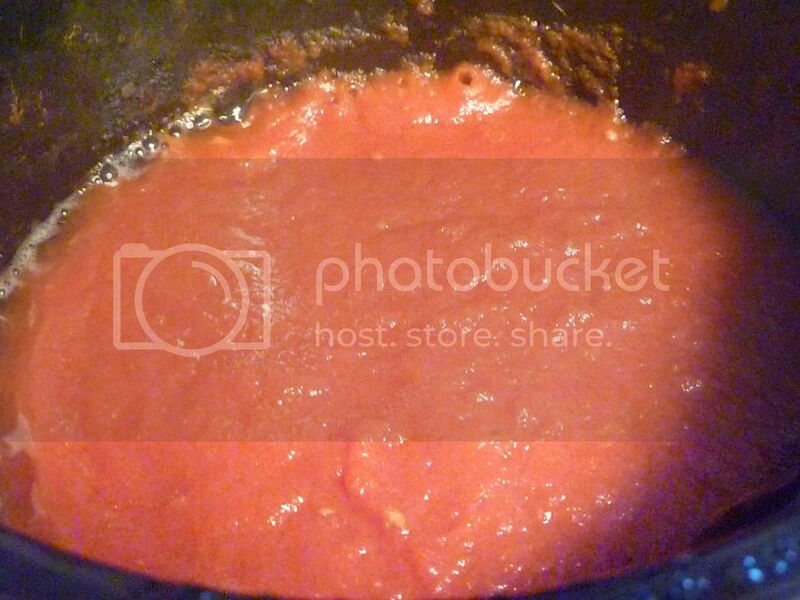 This summer, a friend gave me buckets full of San Marzano tomatoes from her organic garden. I was trying to think of what to do with them, and settled on the easiest recipe ever--tomato paste. This recipe can be done with any amount of tomatoes, and even with canned San Marzanos. 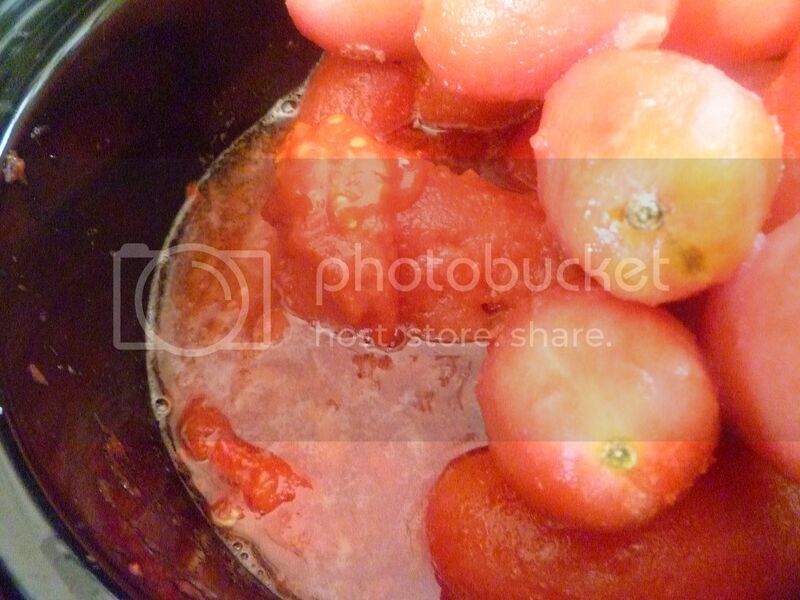 You won't believe how easy it is to make your own tomato paste at home. The first thing I did was rinse and dry the tomatoes, cut off any questionable-looking parts, and pop them in the freezer. Many recipes will tell you that boiling the tomatoes for a minute and then shocking them in cold water is the best way to peel a tomato. I found that the freezing method is far superior--much less messy, and the tomatoes' freshness is preserved in case you don't have time to work with them right away. 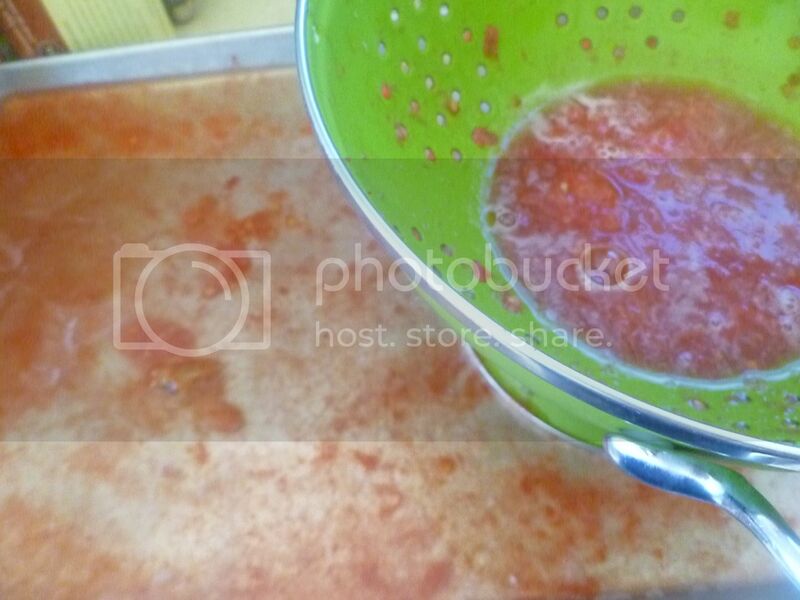 When you're ready to make the paste, remove the tomatoes from the freezer. The heat from your hand should cause the tomato skin to come right off. If it doesn't, just run the tomato under warm water for a second or two. You should have no problems peeling the skin off. Then throw the peeled tomatoes into a crock pot. I turned the crock pot on high and walked away for about an hour. This gave the crock pot enough time to defrost the tomatoes enough to handle. See how much water the tomatoes are giving off? You don't want that. You're making a paste--the more liquid, the longer it will take. 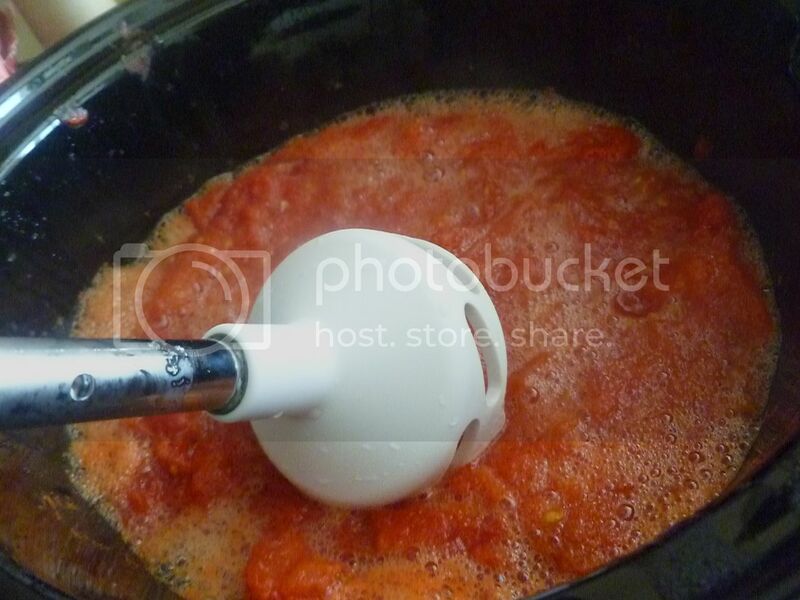 I dumped the now-warmed tomatoes into a colander and drained out the liquid. Then I squeezed the liquid out of each tomato. You could also dump the drained tomatoes in cheesecloth, crush them a bit, and let them hang out in the colander for a few hours. The cheesecloth will make it especially easy to squeeze out the liquid. 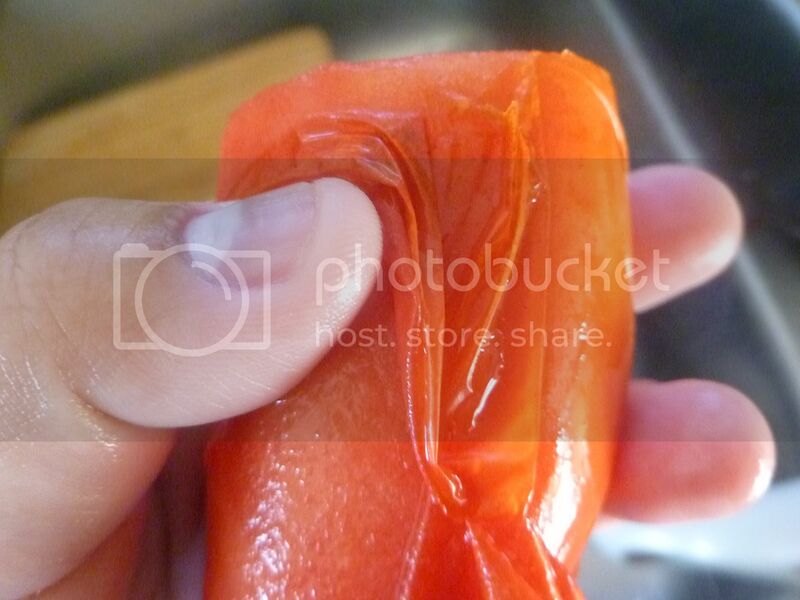 Check out how much liquid I squeezed out of the tomatoes. If you don't want to waste the tomato water, you could save it for something else. 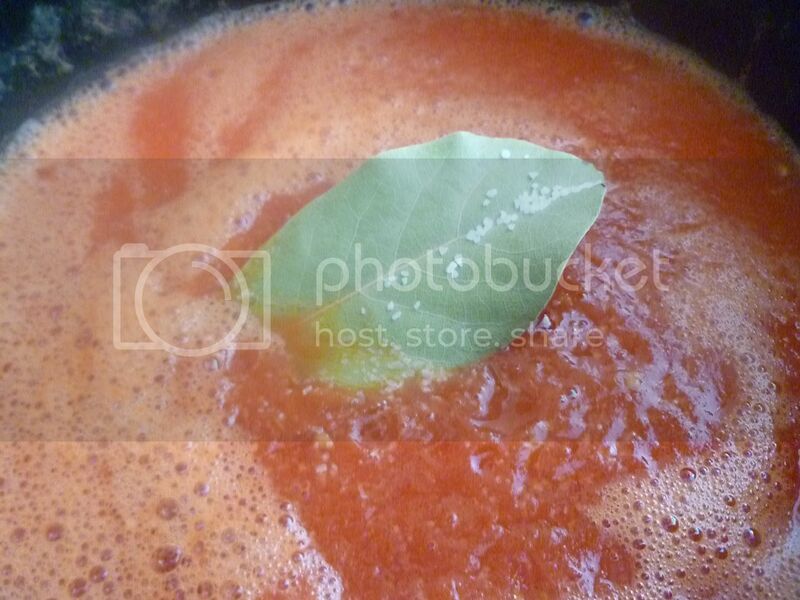 Plenty of recipes out there for tomato water. 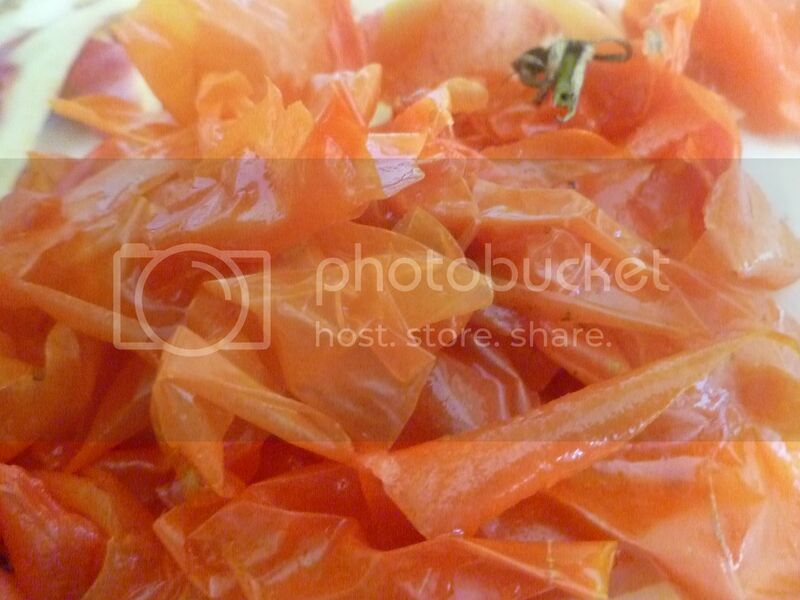 Here's what the squeezed tomatoes look like. Not the most appealing, eh? They were still a tad frozen here. 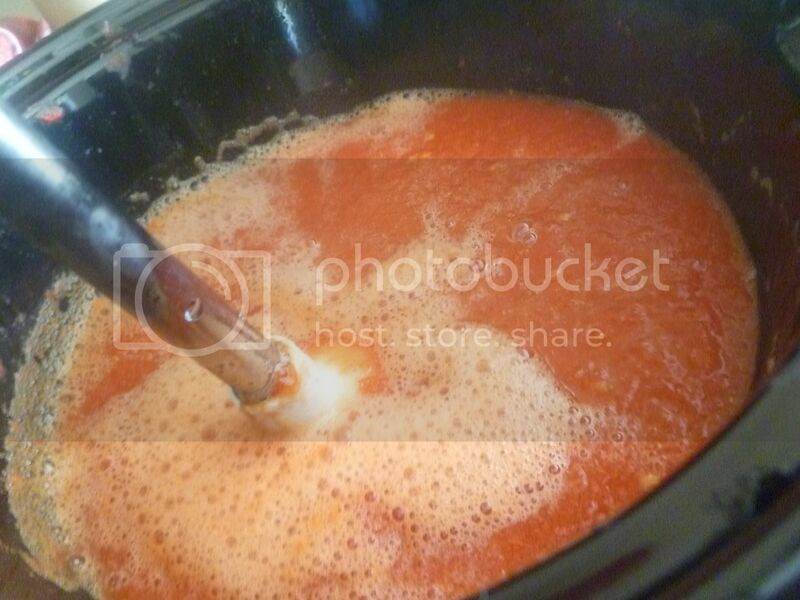 Now turn the crock pot on and let the tomatoes cook. Here's what they looked like after a few hours on high. I wanted a smooth paste, so I grabbed my immersion blender. 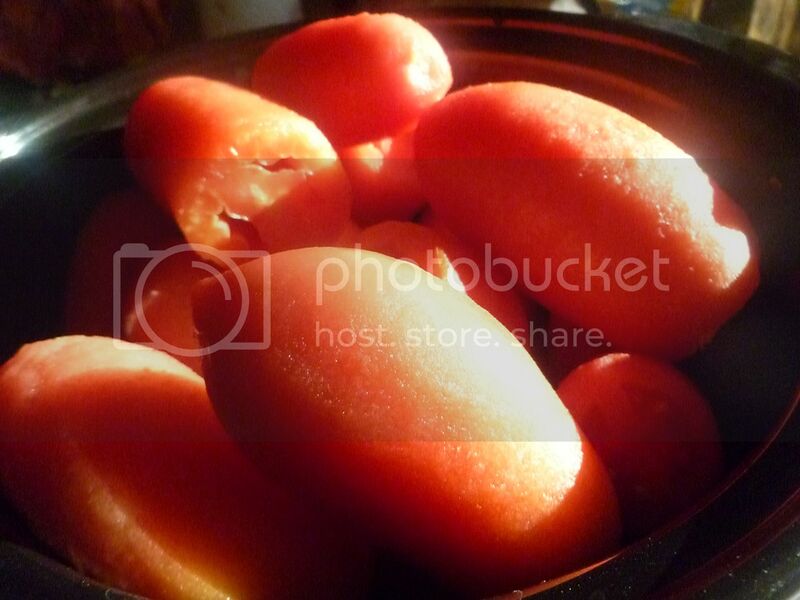 Then I let the pureed tomatoes cook for another couple of hours. I threw in a bay leaf and some salt. 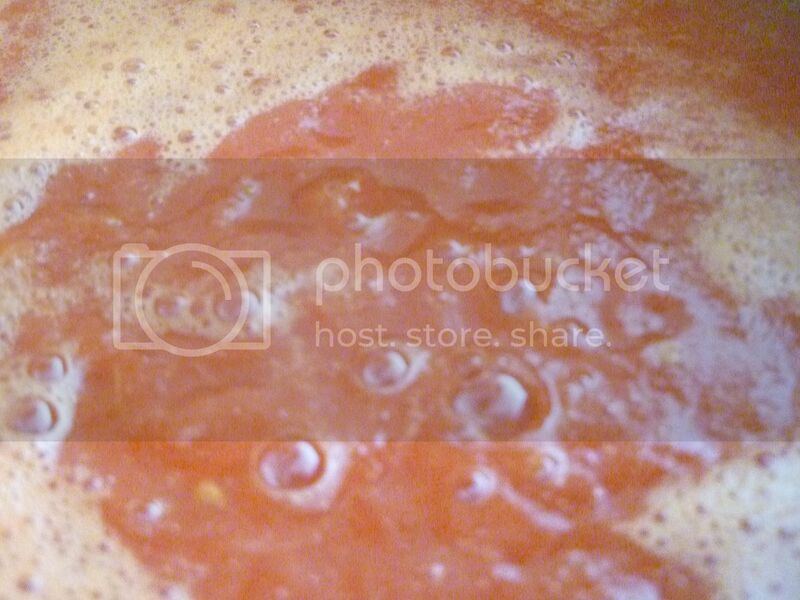 By this time, you should have a pretty thick tomato mixture. I'm sure I could have reduced it further, but the tomato-y goodness seemed plenty concentrated at this point for my taste. I poured it into small, 8-ounce containers and popped them in my freezer. 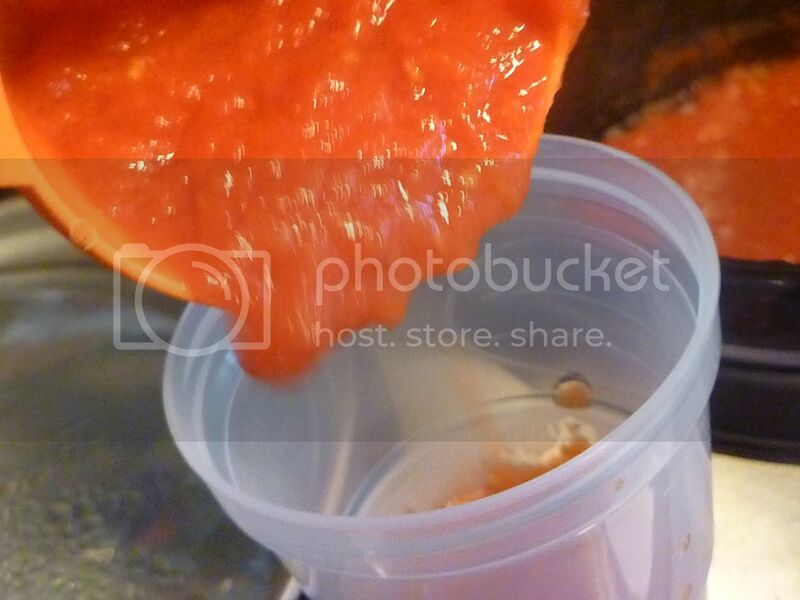 Now you've got nice, fresh, homemade tomato paste on hand for any number of applications! It's the perfect use for late summer tomatoes! 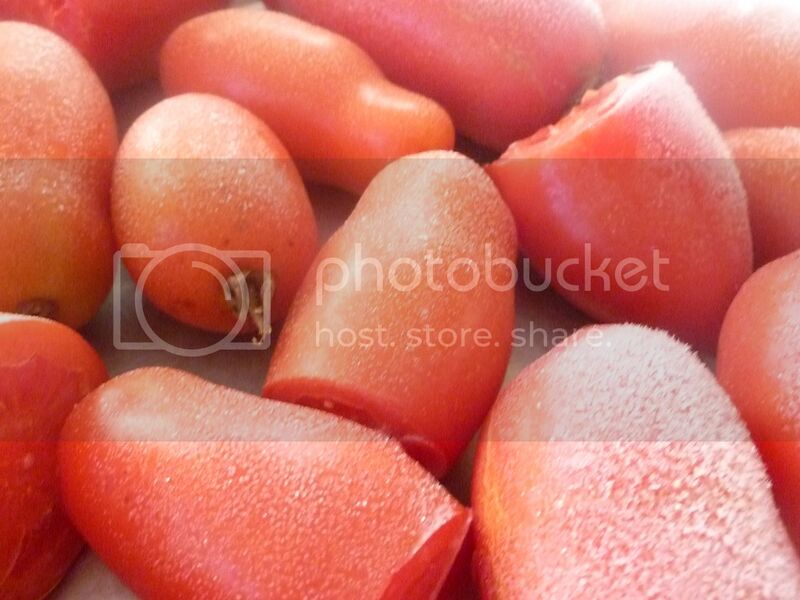 Peel tomatoes using the freezer method. 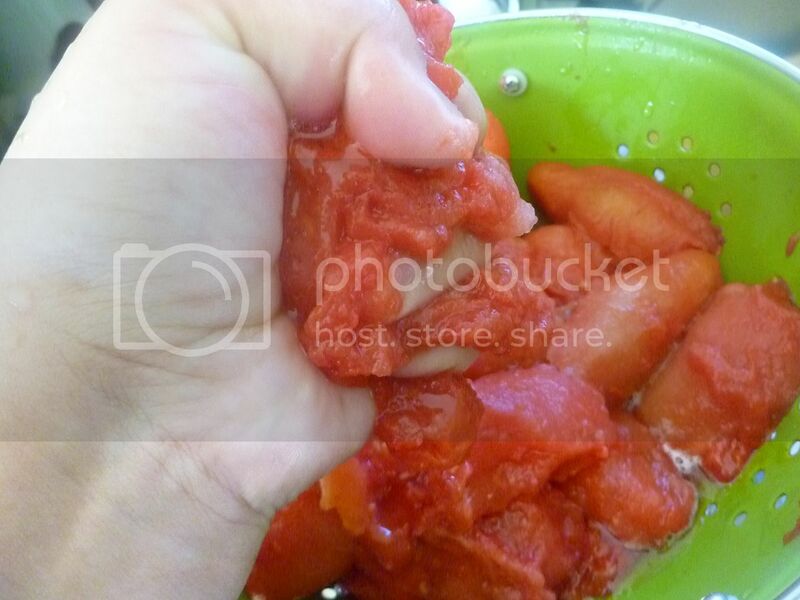 Squeeze as much liquid out of the tomatoes as possible. 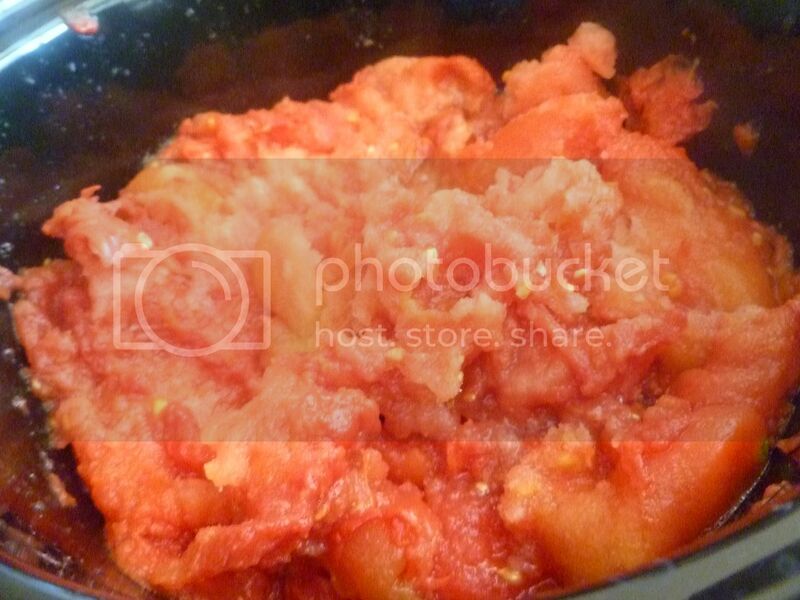 Place tomato pulp in a slow cooker, and let cook for several hours until thickened. Using an immersion blender, blend mixture until smooth. Add bay leaf and salt; continue to cook for 3-4 hours, until thickened. Let cool slightly; move to storage containers.